UPDATE: Friday, November 9, 2018 – this week has seen the absolute bursting of color everywhere, still on the mountain slopes and now down in the lower lands also. It’s always hard to pick the peak, and this year it was thrown even later in the year by the warm summer. But the colors for the last 3 weeks have been wonderful. Lots of reds this year. UPDATE: October 17, 2018 – there is color in the higher elevations, not completely saturated yet, but coming soon. Slightly later start to the changes this year – add a good 15 days delay to the sequences described below. Autumn leaf color changes in Great Smoky Mountains National Park is for many people the event of the year. The rolling mountain landscape forested with more than 100 varieties of trees provides a display of changing colors that lasts for almost 7 weeks. The leaves begin to turn on the mountain tops and higher elevations around 6,000 feet as early as mid-September. The latter half of this month is a good time to be up in the mountains, hiking and driving to the scenic overlooks that provide good mountain panoramas. Scenic drives in late September include Newfound Gap Road and Clingmans Dome. Higher elevation hikes good for this time include Andrews Bald and Mt. LeConte. In the first part of October, the mountain tops have passed their peak but still have color, while the middle elevations above 4,000 feet come alive with leaf changes. By mid-October, the large swath of elevations between 3,000 and 5,000 feet will fill to their peak with colors. At this time the more accessible and moderate hikes can yield enormous rewards in scenery. During the first half of October, scenic drives include Clingmans Dome Road, Foothills Parkway and Blue Ridge Parkway. This time presents the largest and most spectacular vista of colors as landscape and photo memories. Further down towards Gatlinburg and Cades Cove elevations, everything is still mostly green. As the color moves gradually down the slopes to the lower elevations, the earlier yellows and more sparse reds give way to richer colors in greater profusion and variety, with many reds and golds appearing. 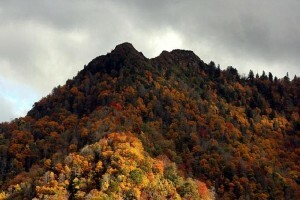 During the last half of October the peak color usually occurs in the lower elevations. When the lower elevations hit their peak there is also the feel of being surrounded by color everywhere you turn. This is a great time to be in Gatlinburg and driving along Little River Road towards Cades Cove. 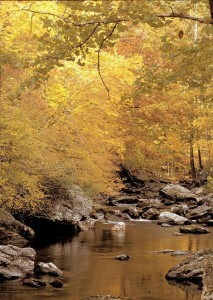 Hiking the trails from Cades Cove is one of the best ways to enjoy this color – the one to Abrams Falls is very popular. 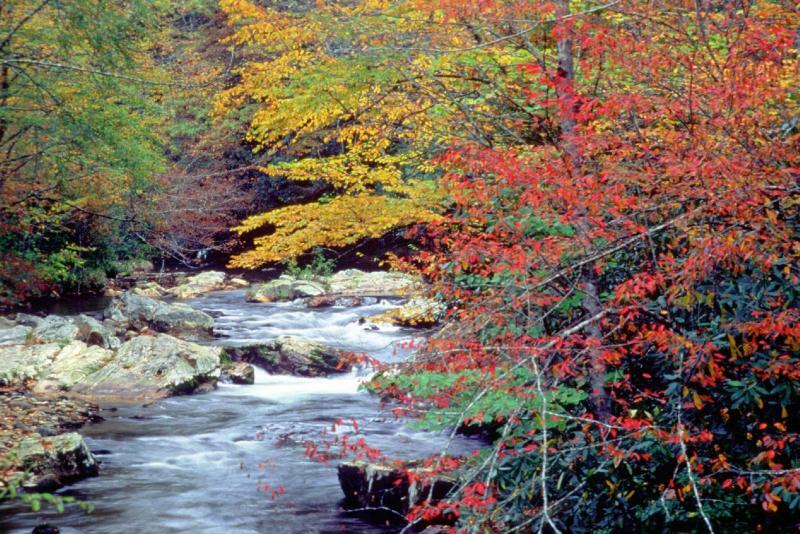 A great scenic drive is Roaring Fork Motor Nature Trail, a one-way loop road that starts right in Gatlinburg. There are many walks and overlooks, with gorgeous waterfalls, all relatively accessible, some even visible from the car. For many people, the last half of October is the peak time to visit the area. The weather affects the times of color peaks, but usually a lot of color will last into early November regardless. The guessing game of when and where the peaks will occur is made easier by the helpful park rangers. Check the updates on the Fall Colors update page at the park website. Cold weather and rain both enhance the fall colors – the cold hastens the leaves turning, and the colors appear more vivid in rain. The only weather upset that people wish against is strong winds that can blow leaves off the trees. The scenic opportunities are vast in Great Smoky Mountains National Park, and the most comprehensive guide to activities is the park website. 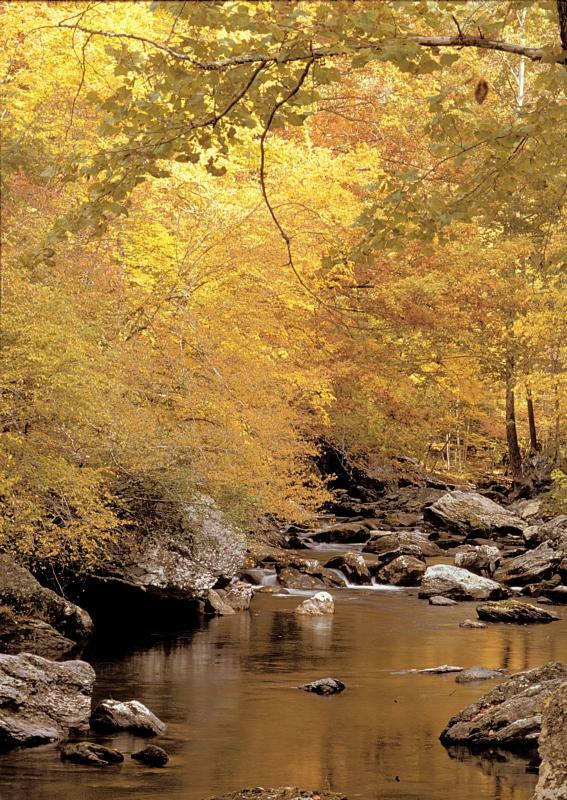 Check in with the park’s Autumn Drives and Hikes guide. Also see our selections in our Driving and Hiking pages here. Crowds and traffic are the burden of being popular. To avoid these, try some of the less well known but equally beautiful places to drive and hike. The park rangers have this figured out for you also, see their Off the Beaten Path page. The Cosby end of the park is less visited and more tranquil. Parson Branch Road is well worth exploring, with the quiet feel of old forest. And finally, when you’re in the area, there are some fun ways to see the fall colors without entering the park. 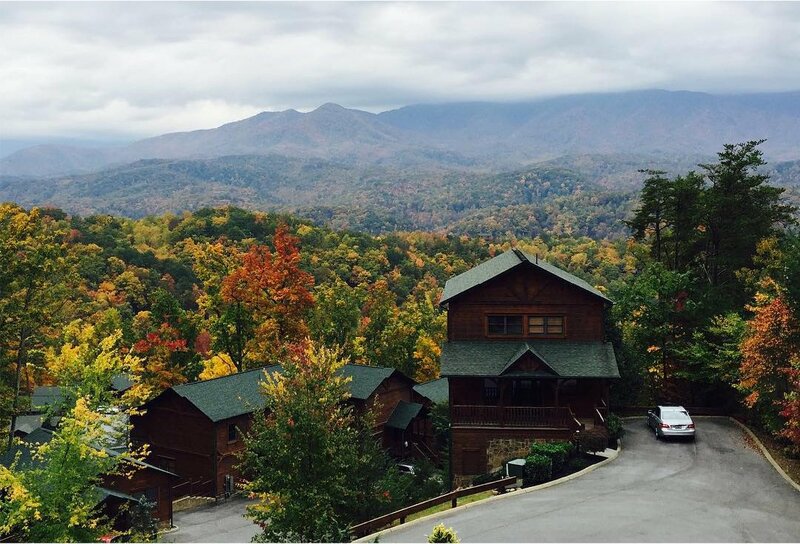 See our blog on The Top 10 Ways to Enjoy Fall Colors in the Smoky Mountains.